On the first day of the Los Angeles teacher strike, the sights and sounds were loud and flashy: Teachers with picket signs at a thousand schools. Car horns honking their support. At least 20,000 people shouting and marching downtown. Reports on every newscast. Under the radar were the parents of 140,000 students who crossed the picket lines to take their children to class — because they said they had no choice, because they thought their kids might be better off at school, might be safer, might be able to keep from falling behind in their schoolwork. At Sunrise Elementary in East Los Angeles, some of the parents of the 120 students who attended school Monday kept their heads down to avoid eye contact with their teachers as they arrived. They protected their children from the rain, but also from a situation that some did not fully understand. Josefina Gil walks her third-grade daughter into Sunrise Elementary on the first day of the strike. “I don’t know what to think,” said Josefina Gil, mother of a third-grader at Sunrise. “I don’t want to talk because I’m not sure if I’m doing the right thing. I want to support my daughter’s teacher, but I have to go to work and she’s better here in school. I have no choice,” Gil said in Spanish, her voice shaky. She lingered, looking toward the campus for support. One staff member had to assure her that her daughter would be fine. “We will walk her to the classroom, don’t worry,” the woman told her. Another parent tried to be on both sides of the picket line. Mariana, who didn’t want to give her last name, said she was in support of the teachers but had to take her daughter to school. After dropping off her daughter, she picked up a poster in one hand, balancing her baby girl and an umbrella in the other. She stood next to a woman who said she didn’t want to talk. Mariana was also hesitant to speak but explained that she’s just trying to do her best to help the teachers. “But apparently I’m not doing what I was supposed to do,” because she had brought her daughter to school. For Juan Garcia, the strike was totally unexpected despite all the news coverage leading up to the teachers walking off the job. “I didn’t know anything about it. He is my girlfriend’s son. She asked me to take him to school so I’m just dropping him off. I didn’t know about the strike,” he said. Sunrise’s enrollment this year is 340 students, and school officials said about a third attended Monday. That was roughly the same percentage reported districtwide for the first day of the strike. Attendance rose to 163,384 students on the second day of the strike, the district said, up from 143,993 students on Monday. Total enrollment is about 480,000 in traditional K-12 schools. Cedillo said she is in full support of the teachers — “They do good things for our kids” — but she’s also afraid about the consequences of parents not taking their children to school during the strike. Parents at charter schools that share the same school campus with district schools had been warned they may face disruption and hostility, though on the first day, none was reported. Crown Preparatory Academy and 24th Street Elementary share the same entrance, where two school police officers were stationed Monday. A family shows their support for teachers outside 24th Street Elementary on Monday. A parent who didn’t want to give her name said she was afraid to talk. She looked visibly uncomfortable, looking down and trying to hide under her umbrella as she chose to wait behind the line of teachers picketing rather than cross it to pick up her daughter after school. The downside of the strike for Sanchez is that her son will miss school for the first time this year. Attendance has been one of the main concerns among parents. 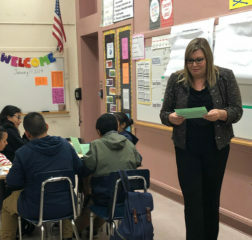 L.A. Unified’s Chief Academic Officer Frances Gipson, who taught several classes at El Sereno Middle School on Monday, said that seniors’ absences during the strike wouldn’t keep them from graduating. Schools remain open during the strike, and district officials have instructed all students to attend regularly. Any absences are to be marked as unexcused. But a district spokesperson said that any consequences for missed classes would be at the discretion of the principal. According to California law, a student who has more than three unexcused absences is considered truant, and further corrective actions may be taken by the school district, including mailing truant notifications and requesting documentation to justify the absence. Pia Escudero, the district’s executive director of student health and human services, told Univision on Wednesday that absences during the strike will not affect students with perfect attendance and that they will still receive their recognitions once classes resume. Virginia Justice, a parent in the San Fernando Valley, said her fourth-grade son’s safety was her primary concern, more than facing consequences for his absences. He attends Stonehurst Elementary, an L.A. Unified magnet school in Sun Valley. 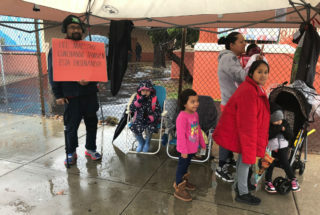 Cecilia Posada’s main concern during the strike was that her three children would miss out on instruction, so she said it was an easy decision for her to send them to school Monday. Two of them attend Roscoe Elementary, the other Stonehurst. She said Roscoe’s principal told parents that the students would continue their regular classroom instruction and that they should be at school learning. But Posada said that did not happen Monday. Her kids told her they just watched movies and did some physical activities. Now, she said she’s worried they won’t be learning and they will not be safe. So she kept two at home on Tuesday. But the other wanted to go to school. “My son with special needs was mixed with other students, not only special ed students, and he needs special support. I cannot continue sending him to school if that’s the case. I don’t even know the people who are watching them. I have never seen them before. I’m just disappointed,” Posadas said. 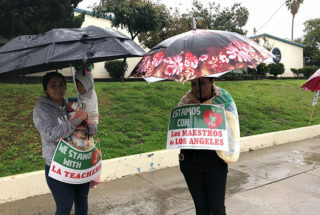 A survey among Los Angeles County residents released Tuesday by Loyola Marymount University showed majority support for teachers in the strike. The survey of 425 residents, which is still ongoing, was started before the strike began. Among the respondents so far, 53 percent said they “strongly support” and 24 percent “somewhat support” teachers striking to achieve their demands. Among parents with children at home, just 18 percent opposed the walkout. L.A. Unified’s strike hotline for parents and guardians is 213-443-1300. A family resource guide is also available here. 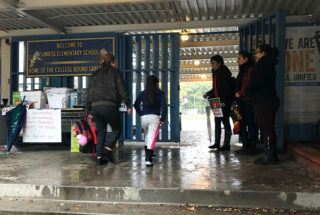 Families In Schools, a parent advocacy community organization, on Monday launched a “Strike Watch” campaign to provide parents and community members with links to resources and information about the strike, including parents’ legal rights. *This article has been updated with L.A. Unified’s latest attendance figures and guidance on attendance.